Apple’s “Netflix for news” subscription service hasn’t launched yet, but a new report from The Wall Street Journal suggests the tech company is looking to take a 50 percent cut of revenue from the new service. The paid Apple News service is said to work a lot like Netflix or Hulu does for TV shows — users would pay a single monthly price to Apple and get access to a wide range of paid news sources and magazines all bundled together. But Apple is apparently running into issues with publishers over how much of that money (rumored to be $10 per month per subscriber) will make its way back to the creators of the content. According to the WSJ, Apple is currently proposing deals in which it would keep half that revenue for itself, while the other half would be divvied up based on how much time users spend reading each publisher’s content. The model is similar in ways to how Spotify has calculated artist payouts in the past based on overall listening times. Notably, the WSJ claims the proposed price split means major news sites like The New York Times and Washington Post have yet to agree to license content for the service. (For its part, the WSJ also says its own talks with Apple are going well.) 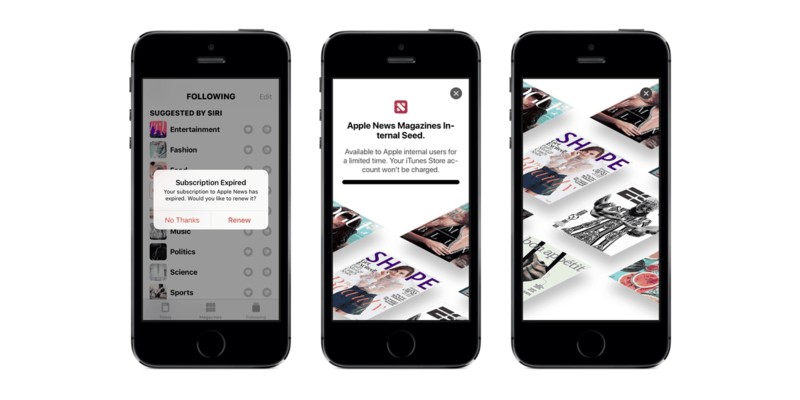 Publishers are also concerned they wouldn’t get access to subscriber data with Apple’s news service, depriving companies of the email and credit card information that’s key to marketing efforts, leading to another point of contention. We’ve been down this road before, too — Apple trying to extract unreasonably unfair terms from content creators is what has doomed its TV ambitions for years, to the point where Apple simply is now spending millions in creating its own exclusive content for its upcoming TV service instead of licensing from other sources. Adding to the pressure is that Apple’s paid news service is coming at a critical time for the company, one that has seen iPhone sales slump and a new emphasis on services as a key revenue source for the company. Apple News comes preinstalled on every one of the billions of iOS devices in the world, and converting even a fraction of those users into ongoing paid subscribers would be a huge addition to Apple’s services business. It’s a strategy the company has already used to achieve great success with Apple Music, which leveraged its first-party positioning to offer actual competition to Spotify. Pulling a similar coup with News and its 90 million users would be key to the company’s future — but it needs to have compelling content, from partners who feel the deal is worth it, in order to accomplish that. Asking already beleaguered news publishers to fight over just half the total revenue on a per-view basis seems like a bad way to start. Apple is still said to be negotiating exact details with publishers and finalizing its plans for the service, which is rumored to launch sometime later this year. So it’s possible this could all change. But as a starting point of negotiation, it seems like Apple may be asking for too much.